Company lawyers and outside counsel for Synthes Inc. have been busy lately, filing lawsuits against former employees and some of the companies that have hired them, and alleging raids on staff, breaches of confidentiality agreements, and violations of patents. The litigation might soon be the concern of global health-care giant Johnson & Johnson. During a recent meeting at the Synthes headquarters in Switzerland, shareholders approved a $21.3 billion takeover by J&J, which is based in New Brunswick, N.J., and has operations in the Philadelphia area. The deal should close in the first half of 2012. 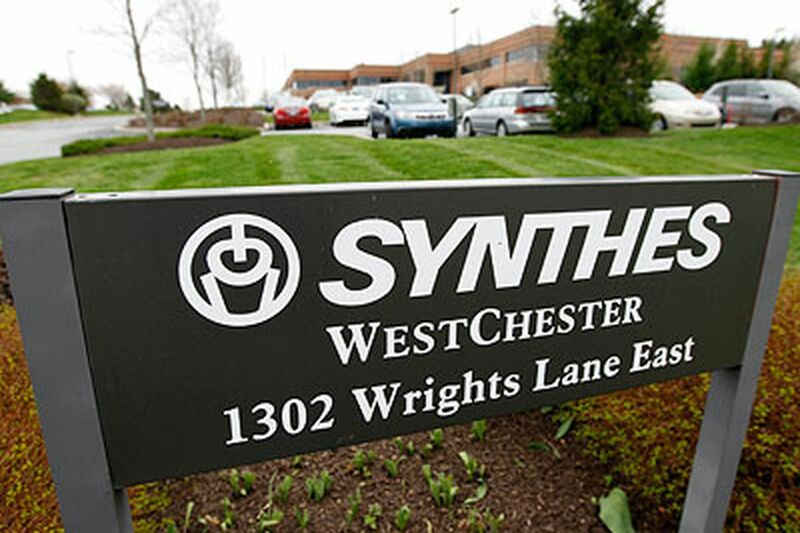 Synthes, a manufacturer of medical devices, has its U.S. headquarters and other facilities in Chester County. Among the latest Synthes suits was one filed Wednesday in federal court in Philadelphia against three former company sales representatives in California and rival Stryker Inc., which hired them to sell nails, screws, plates, other devices, and tools to fix broken bones, mostly related to spinal ailments. Stryker is based in Kalamazoo, Mich., but has two facilities in northern New Jersey. In what might be news to some surgical patients, the sales representatives for medical-device companies are frequently in the operating room. Surgeons - who often decide which brand of expensive devices is to be purchased - are the target of sales efforts and often seek the guidance of the sales representatives. The latest Synthes lawsuit charges a former sales representative with a mercurial change of loyalties. It contends that Michael Russell, shortly after his resignation, "began soliciting and assisting" physician customers in the San Francisco area with whom he had been working on behalf of Synthes. Synthes charges: "Moreover, on at least one occasion, Russell used Synthes medical devices to complete a surgery on behalf of Stryker, and without Synthes' knowledge." Russell could not be reached for comment. Jonathan Sassani and Kristen Phillips-Cheng were two other former Synthes sales representatives named in the suit. Sassani declined comment. Phillips-Cheng could not be reached for comment. A Stryker spokeswoman declined comment, and a Synthes spokesman in Switzerland could not be reached. "The company's position is that it does not comment on pending litigation," said Blank Rome attorney Anthony Haller, who is directing at least two of the Synthes suits against former sales representatives. A different suit was filed in Philadelphia on Dec. 1 against Kosta Kobakof, who spent more than 14 years at Synthes, rising through the ranks to be an area vice president, before leaving in November for a position at K2M Inc., which is another Synthes competitor. Like the other suit, Synthes says that Kobakof is using inside information against his former employer, thereby violating non-compete and nondisclosure agreements. Neither Kobakof nor his attorney could be reached for comment. K2M was not named as defendant. A message left with K2M's legal counsel was not returned Thursday. Synthes' patent fights include a suit filed in July against Globus Medical, which is in Audubon, Montgomery County. Another suit against Globus was filed in 2010 regarding different patents. Attorneys in the recent patent case could not be reached for comment. The patent fights are signs of the two companies' competition in the market for devices to treat spinal ailments. But there is another element: Globus was founded in 2003 by former Synthes executive David Paul, and other Synthes executives followed him. Paul could not be reached for comment. His biography on the Globus site provides some evidence of the competitive pressures in this sector. It notes that Paul was a named inventor on approximately 25 patents while at Synthes. "Since its inception, Mr. Paul has directed Globus's growth into one of the top ten spine companies in the world," the biography says, "and his product development team has over 85 patents already filed and pending on behalf of Globus." at www.philly.com/phillypharma and on Twitter @phillypharma.